The world is watching the wedding of Prince William and Kate as i am writing this post. Im in front of the TV as well, don’t want to miss it! Still have some urgent task to finish, so i ‘work’ in front of TV, which mean my eyes will be 80% with TV and 20% with my work.Hehe..At time, Prince William had arrived with Prince harry..Aww..can’t wait to see Kate.. I watched Oprah just now and its something about a woman who has no memory of her childhood because of some tragedy that she herself dont know what. She was weight 716 pounds and to date she has dropped almost 230 pounds. Feeding pain is what people usually do when they don’t know how to express the pain or how to make it go away. This will cause the tendency to do something to distract the pain. Some people don’t want to face a problem. they will always think that the problem will go away by itself. they never realize that it will always stay, just waiting for something to trigger it-and only it will explode. For me, i would say i prefer to talk the problem. But to talk the problem with someone who prefer to hide it is very difficult. Some people just don’t want to confront other people to get answer and the solution. They prefer to be the victim not to realize that it kills other people inside. Alll things that you do or said had a consequences-if you brave enough to do it-you should be brave enough to be responsible for your thought -act or words – rite? I always love reading and i love my books..Recently i went to Ranau Library with my mom(she’s a book lover as well 😀 ) and i was amazed on how the Ranau Library had changed! It now has its own building, compare to 10 years back when it was located at upstairs of a shop lot! Thank you to whoever it is to finally realize Ranau needs a better library. Well went inside the library it is quite huge divided into few sections. It also has a multimedia section where some research can be made computerized-no facebooking of course! I am so excited with the new library-well to consider that i always happy with lots of books around me :). It was a weekdays when i went there for the first time and there was not much people. Second time, yes a lot! At least people know how to appreciate library. Interesting book actually..maybe not many people realize that the library actually has quite a few interesting books apart from novels. I am really interested in Sales and Marketing but i couldn’t afford to enroll myself for any class yet-so yep i use all the resources (free) as i can to get educated, study and maybe will just sit for the exam one day? Sometimes i wonder why is that i study Computer Science before and not Business and Marketing..But i never regret it-i always believe that life is a school – we learn something new everyday. A lion met a tiger as they drank beside the pool. “That’s not foolish,” said the lion with a twinkle in his eyes. Thought he’d try the lion’s trick, but his roar was just a squeak. A fox was walking by that way, had luncheon in the woods. The Moral: Never advertise unless you have the goods! Do you believe in soul mate? 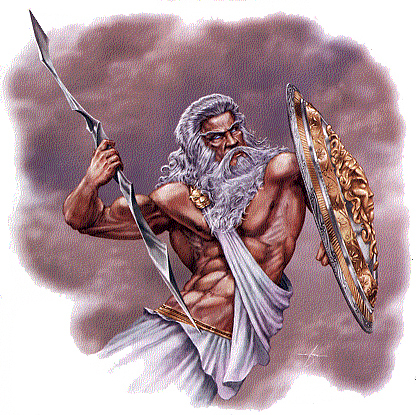 The Greeks believe that Zeus created us with four arms four legs and two heads. He decided that we had too much power so he took away the extra body parts making it, that we spent the rest of our life’s searching for the other half. I always interested with the term ‘soulmate’. Does it really exist? How does one know when they found their soulmate? Well people fell in love so many times and each time they will call the person their ‘soulmate’ ain’t they? According to Theosophy, whose claims were modified by Edgar Cayce, God created androgynous souls—equally male and female. Later theories postulate that the souls split into separate genders, perhaps because they incurred karma while playing around on the Earth, or “separation from God.” Over a number of reincarnations, each half seeks the other. When all karmic debt is purged, the two will fuse back together and return to the ultimate. Maybe being a grown up woman now make me realize that the term is actually define by ourself. We can call anyone our soulmate well just to show off to other people or that we really feel like we connected by soul with the other person. I don’t know, to call someone ‘my other half’ is really a big thing when you actually still have a doubt- even a slightest doubt, with the other person. Even when you think you had found your soulmate, lots of things might stand between you. It could be a distance, or maybe people who hate you so bad and will do anything to keep you from your soulmate. As the saying goes ‘true love never run smoothly’. 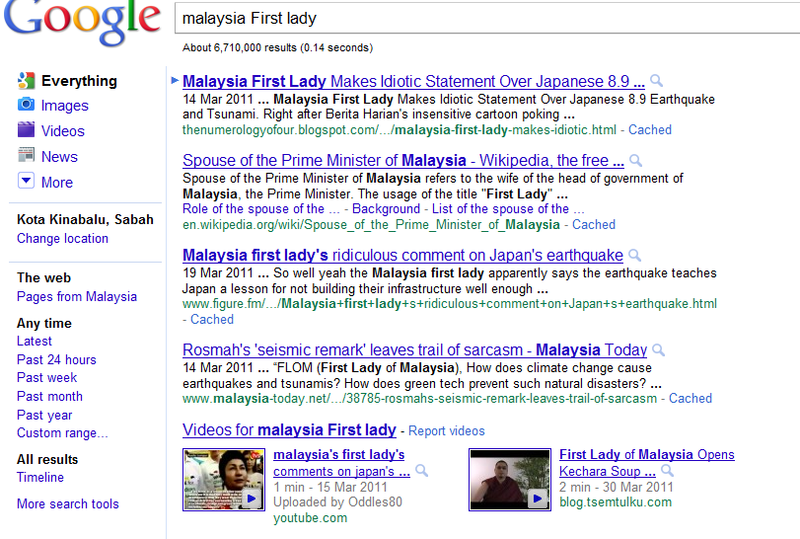 Hmm ..Mostly related to her remark on Japan..Did anyone from the government or PM himself give any comment regarding her comment on Tsunami? Im just wondering.. 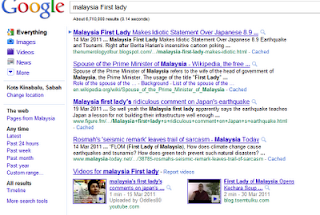 But hey, it’s just Google, if Google display the list of negative comments on our very own First Lady, who cares rite? As i said, its just Google..
Well she did defend herself , give her a chance people, common, check out her video to all of us..
Forgive and forget. That’s what they say. It’s good advice, but it’s not very practical. When someone hurts us, we want to hurt them back. When someone wrongs us, we want to be right. Without forgiveness, old scores are never settled… old wounds never heal. And the most we can hope for, is that one day we’ll be lucky enough to forget.